Pulse of the Heart: Farmed or Wild Salmon? For a middle-aged guy who has had a coronary and doesn't want to have another one, the risks from pollutants in the farmed salmon are minor ones, and the omega-3 benefits him in a way that far outstrips the relatively minor risks of the pollutants. If cautious, consumers with a history of heart disease could choose farmed salmon from Chile for their high omega-3 content and relatively lower level of contaminants. Younger consumers without a history of heart disease should consume farmed fish from Chile no more than about six times a year. Farmed salmon from North America would be a better second choice than European farmed salmon. Consumers should not eat farmed fish from Scotland, Norway and eastern Canada more than three times a year. Farmed fish from Maine, western Canada and Washington state should be consumed no more than three to six times a year. Wild chum salmon can be consumed safely as often as once a week, pink salmon, Sockeye and Coho about twice a month and Chinook just under once a month. 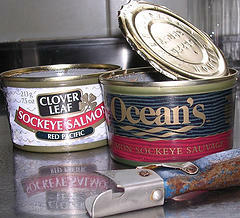 One suggestion: sardines, smaller in size, contain fewer contaminants. "On the one hand, farmed salmon has more heart-healthy omega-3 fatty acids than wild salmon." --Didn't know that. I thought it was the opposite. But this is also scary: "Farmed fish from Maine, western Canada and Washington state should be consumed no more than three to six times a year." --One doesn't always know where the farmed salmon came from. Is it THAT bad that is has to be limited so much? If so, wouldn't one be better off with the natural wild salmon?? The pelletized feed fed to farmed fish is high in omega-3s, but also high in contaminants. However, the FDA and other experts in the field of toxicology believe the contaminant concern is overblown. Most farmed salmon in the U.S. is from Chile. You can ask the manager of the fish department where you purchase your salmon where it comes from. He or she most likely knows. So, as farmed salmon is so readily available, and you have a concern about contaminants, go for the Chilean. Add the canned sockeye or pink salmon, for a taste of the wild, and consider fish oil capsules (see December 22nd post) on the days you don't eat fish or other foods like flaxseed, which contain omega-3s.